SOUTH PORTLAND, Maine—Farmers and gardeners have valued The Old Farmer’s Almanac for its advice on growing, preserving, and preparing food since its founding in 1792. In the new book, Field to Fork: A Collection of Classic Recipes (ISBN: 978‐1‐4162‐4664‐0; $19.95), the Almanac’s editors have compiled over 120 of their best recipes that use fresh produce at its peak of flavor to create tried‐and‐true Almanac favorites. 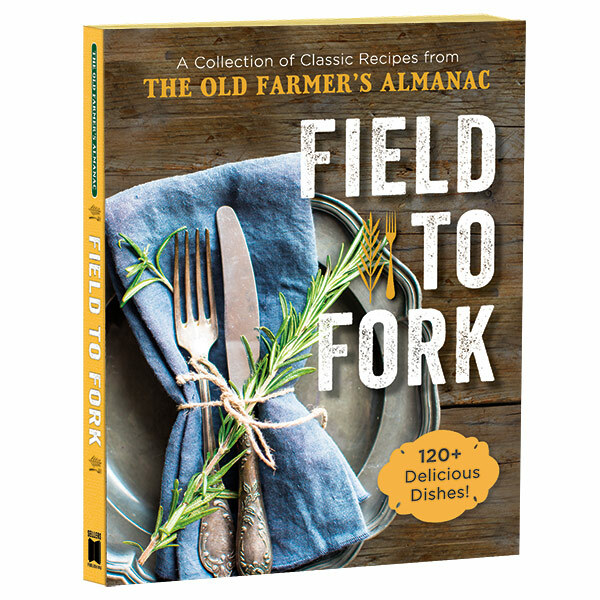 Field to Fork: A Collection of Classic Recipes is a 7″ x 9″, 192‐page, softcover book that will be published in September, 2018, and will retail for $19.95. It will be available in bookstores and specialty shops nationwide and through Sellers Publishing’s Web site, sellerspublishing.com. The Old Farmer’s Almanac originates from Yankee Publishing, Inc. publishers of Yankee Magazine in Dublin, New Hampshire. The Almanac’s editors also produce the Garden Guide, digital monthly magazine EXTRA!, The Old Farmer’s Almanac for Kids, calendars, and cookbooks such as Readers’ Best Recipes and the Stories Behind Them. Daily Almanac wit and wisdom is available through Almanac.com, Facebook, Pinterest, Instagram, and the Amazon Echo and Google Home voice assistants. Sellers Publishing, Inc. is an award‐winning publisher of books, calendars, greeting cards and journals. The company was cited for four consecutive years by Publishers Weekly for being among the fastest growing independent publishers in the country. It is located in South Portland, Maine and can be contacted at 800‐625‐3386 or by visiting their Web site at www.sellerspublishing.com. SOUTH PORTLAND, Maine—According to a 2015 UN report, the global population aged 80 or older is expected to grow from 125 million in 2015 to 202 million in 2030 to 434 million in 2050. In 80 Things To Do When You Turn 80 (978‐1‐4162‐4610‐7; $16.95), a new book from Sellers Publishing, 80 notable achievers reveal how they have meaningful, dynamic lives at age 80 and beyond. • Donald Hall, an author, Poet Laureate of the United States in 2006‐2007, and 2011 National Medal of the Arts recipient. • Pat Boone, a movie star, gold‐recording artist, best‐selling author, Broadway show headliner, and television star. • Tab Hunter, an actor who starred in over 40 major motion pictures, and successful recording artist, with one of the top records of the rock and roll era, Young Love. • Ruta Lee, an actress, dancer, and one of Hollywood’s most glamorous ladies. She appeared in such illustrious films as Seven Brides for Seven Brothers, Funny Face, and Witness for the Prosecution. • The Amazing Kreskin, a mentalist, who became an integral part of pop culture throughout the world, hosted his own television series, and authored 19 books. • Caroll Spinney, who performs Big Bird and Oscar the Grouch on Sesame Street, roles he has played since the show debuted in 1969. • Richard (“Mr. Debonair”) Dwyer, one of the great artists of theatrical skating who has performed for millions of fans. • Dr. Ruth Heidrich, an author, speaker, nutritionist, talk‐show host, and triathlete, who was named “one of the ten fittest women in North America” by Living Fit magazine. Thanks to the generosity of the contributing authors, all of whom provided essays on a pro‐bono basis, the royalties generated from the sale of this book will be donated to nonprofit organizations dedicated to preventing and curing cancer. 80 Things To Do When You Turn 80 is a 5.5″ x 8.5″, 480‐page, softcover book that retails for $16.95. It is available in bookstores and gift shops nationwide and through Sellers Publishing’s Web‐site, www.sellerspublishing.com. SOUTH PORTLAND, Maine—According to a 2015 study by the American Cancer Society, over 2,200 women are diagnosed with cancer each day in North America. For those women, Sellers Publishing has worked with 25 female cancer survivors who each share their personal stories about how to cope with and prevail over cancer in an inspirational new book, 25 Women Who Survived Cancer: Notable Women Share Inspiring Stories of Hope, edited by Mark Evan Chimsky (978-1-4162-4584-1; $16.95). The authors write with candor about how they faced cancer without letting it define their lives or conquer their spirits. They recall how they reacted to receiving their diagnosis, how they moved beyond fear to become engaged in their healing process, and how they dealt with body image and sexuality while undergoing treatment. Their reflections on what their cancer has taught them, and how their lives have been changed by it, are poignant and powerful. This collection includes the experiences of women who have survived breast cancer, uterine, cervical, and ovarian cancer; Hodgkin lymphoma; and malignant melanoma. Contributors to the book include Joan Lunden, Barbara Delinsky, Liz Lange, Shonda Schilling, Bárbara Padilla, Sylvia McNair, Marissa Jaret Winkour, and more. 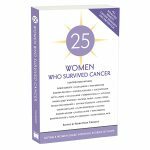 25 Women Who Survived Cancer is a 5.5″ x 8.5″, 248-page, softcover book that will retail for $16.95. It will be available in bookstores and gift shops nationwide and through Sellers Publishing’s Web-site, www.sellerspublishing.com. Sellers Publishing, Inc. is an award-winning publisher of books, calendars, greeting cards and journals. The company was cited for four consecutive years by Publishers Weekly for being among the fastest growing independent publishers in the country. It is located in South Portland, Maine and can be contacted at 800-625-3386 or by visiting their Web site at www.sellerspublishing.com. According to a December 15th, 2015, article in The New York Post, “Nine of the 20 books on Amazon’s current bestseller list contain few words and belong to a genre that didn’t exist two years ago – coloring books for adults.” This trend has led to the genre’s two biggest bestsellers having sold a combined 13.5 million copies in 50 countries over that time span. 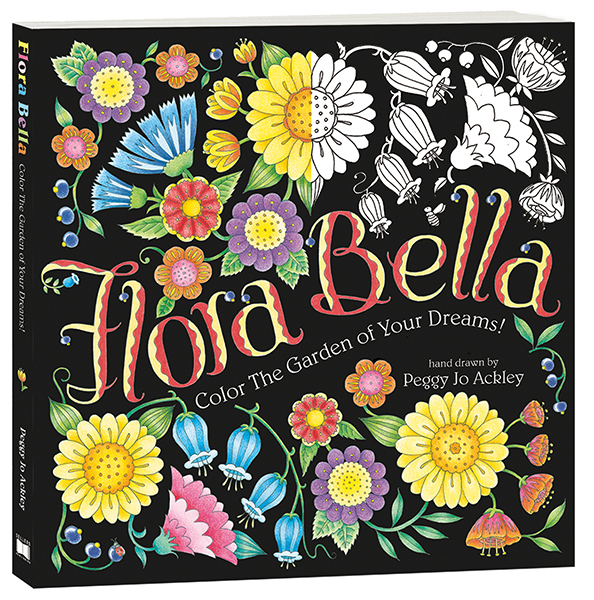 In Flora Bella (978-1-4162-4578-0; $15.95), the new coloring book for adults from Sellers Publishing, artist Peggy Jo Ackley presents 88 original-pieces that those who are new to adult coloring and experienced enthusiasts alike will both enjoy. The hand-drawn designs featured in the book include planters and vases filled with a bounty of flowers and greenery; garden elements like trellises, pergolas, and statues surrounded by flowering vines; and inspirational quotations with hand-lettering and calligraphy. The designs are printed on extra-thick paper with perforated pages that will allow the finished works to easily be framed. Peggy Jo Ackley is one of the most well-respected and prolific artists working today. Her designs have been reproduced on greeting cards, giftwrap, tabletop items, ornaments, rubber stamps and textile products. She has illustrated craft books, baby record books, and children’s books. Her Bitty Bear storybooks and activity books have been hugely popular for American Girl for more than 15 years. She conducts crafting workshops throughout the country and recently became the owner of Pink Ink Stamp Company. Flora Bella is a 9″ x 9″, 96-page, softcover book featuring 88 hand-drawn illustrations that will be published in March 2016, and will retail for $15.95. It will be available in bookstores and gift shops nationwide and through Sellers Publishing’s Web-site, www.rsvp.com. 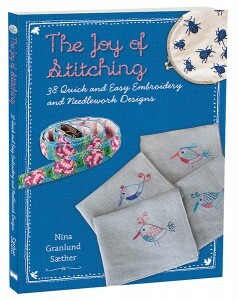 The Joy of Stitching (978-1-4162-4577-3; $19.95), a new book from Sellers Publishing, offers 38 projects that range from embroidered birds on a linen pillow, a design for a fun trolley car, and table linens decorated with simple yet elegant wildflowers, to a needlepoint watch band, a coin purse, and an iPad pouch. Author Nina Sæther’s love of hand embroidery is obvious from the first page. She helps those who are new to the craft with 18 perfectly chosen quick and easy decorative stitches that feature step-by-step instructions accompanied by illustrations. Readers will put their new-found skills to use straight away on projects that are perfect for keepsakes or gifts. All the patterns are included to complete the projects. In her introduction, Sæther presents comprehensive information on the materials and equipment needed, such as a hoop; advice on the basic techniques like transferring a design onto fabric; suggested fabric markers; and types of floss and yarn. She employs a variety of techniques, like cross stitches on stiff, open-weave canvasses, and back stitches on linen. Many of the designs are made on T-shirts and other store-bought items from bed linens to tablecloths, placemats, and napkins. Those with basic machine sewing skills will find useful bags, wonderful wallets, and plush linen pillows with zipper closures. All the projects in this book have something in common: they are embroidered using quickly made stitches. None of the projects demand a lot of time. Author Nina Granlund Sæther grew up in Asker, Norway, just outside Oslo. Her love and interest in embroidery, sewing, knit, and crochet has been a passion since she was a child. In 1987, Nina began her career in journalism as an editor at Norwegian Folk Art & Craft magazine (Norsk Husflid). Today, she is the editor in chief of House & Home magazine (Hus & Bolig), a magazine about houses and home design. Sæther is the author of Making Cushions and Pillows: 60 Cushions and Pillows to Sew, Stitch, Knit and Crochet, 978-1446304259. The Joy of Stitching is a 8″ x 11″, 128-page, softcover book featuring 38 embroidery and needlework designs that will be published in March 2016, and will retail for $19.95. It will be available in bookstores and gift shops nationwide and through Sellers Publishing’s Web-site, www.rsvp.com. A recent article in The New York Times estimated that more than 5.7 million people in the U.S. are active members of book clubs. While the focus of these groups is to share thoughts on a chosen literary selection, the reality is that they often evolve into informal dinner parties with a “bookish discussion,” and that is all part of the fun. For anyone involved in the planning of a book group meeting, the two main items to consider are the book to be read and discussed and a menu for those in attendance. 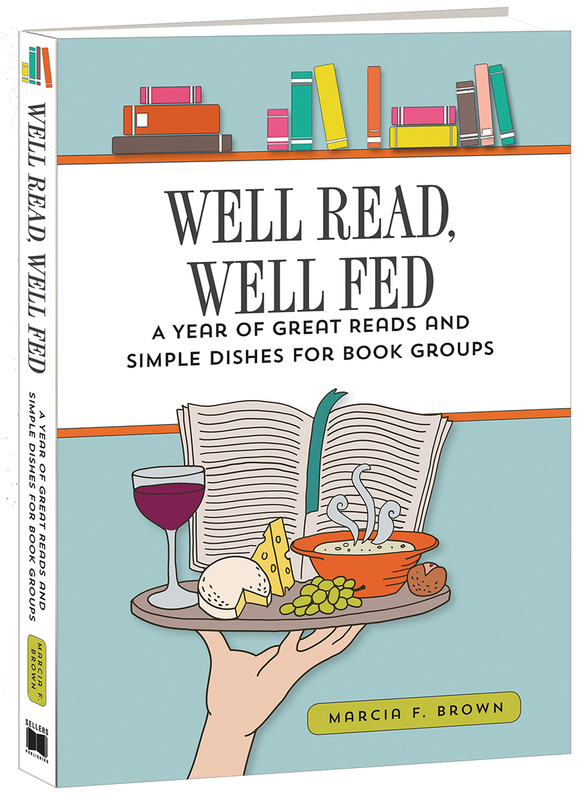 Well Read, Well Fed (978‐1‐4162‐4564‐3; $15.95), a new title from Sellers Publishing, offers suggested pairings for both, covering an entire year’s worth of meetings, with both the menus and suggested book titles matched with the appropriate season. The twelve main dishes presented in the book are intended to be healthful and simple to prepare, and can be made a day ahead or in some cases, further in advance and frozen. “My book clubs have all had at least one vegetarian member and these days, it seems we are all questioning the right amount, if any, of meat we should consume. And because these are light meals before a largely sedentary evening, the menus do not include red meat and are vegetable or seafood‐based. You can always add or substitute meats or poultry if your group prefers,” said Brown. Well Read, Well Fed is a 5.5″ x 7.75″, 160‐page, hardcover book that will be published in September, 2015, and will retail for $15.95. It will be available in bookstores and gift shops nationwide and through Sellers Publishing’s Web‐site, www.sellerspublishing.com. Marcia F. Brown is the author of four poetry collections, including When We Invented Water (Moon Pie Press 2014) and What On Earth (Moon Pie Press 2010). As Poet Laureate for the City of Portland, Maine (2013‐2015) she edited the anthology, Port City Poems, Contemporary Poets Celebrate Portland, Maine (Maine Poetry Central 2013) which was a finalist for the 2014 Maine Literary Awards, and launched the Words Matter Visiting Poets Series presenting acclaimed poet Tony Hoagland at Portland’s Hannaford Hall in April 2015. Her work is widely published in literary journals and anthologies, including Garrison Keillor’s Good Poems, American Places (Penguin Books 2011). Her book of essays and food writing, Well Read, Well Fed ~ A Year of Great Reads and Simple Dishes for Book Groups will be published in Fall 2015. She resides in Cape Elizabeth, ME with her husband. SOUTH PORTLAND, Maine—Sellers Publishing today introduced two new craft titles for fall 2015 ‐ Baby & Me Knits from author Celeste Young, and Yarn Happy from Norwegian author, Turid Lindeland. Both titles will be released in September, 2015, and will retail for $19.95 each. Baby & Me Knits (978‐1‐4162‐4541‐4) features 20 hand‐knit designs for every season and style. Knitters of all levels will find inspiration in author and new mom Celeste Young’s patterns — simple knit and purl textures that give way to subtle lace, cables, and stranded colorwork, each accompanied by clear instructions and how‐to photography. Young’s combination of modern, washable yarns and stitch patterns are sized for newborns through 24 months of age. The blankets, sweaters, and coordinating accessories for baby and mom are perfect for that keepsake knitted gift from a friend or family‐member. more. Yarn Happy is designed for both for intermediate and experienced knitters, as well as fans of colorwork. Patterns include both US standard and metric measurements, and alternative yarns are included for each pattern. Yarn Happy is an 8 x 11 inch, 128 page, full‐color paperback book that will retail for $19.95 and Baby & Me Knits is a 8.5 x 10 inch, 128 page, full‐color paperback book that will retail for $19.95. Both titles will be available in bookstores and gift shops nationwide and through Sellers Publishing’s Web‐site, www.sellerspublishing.com. 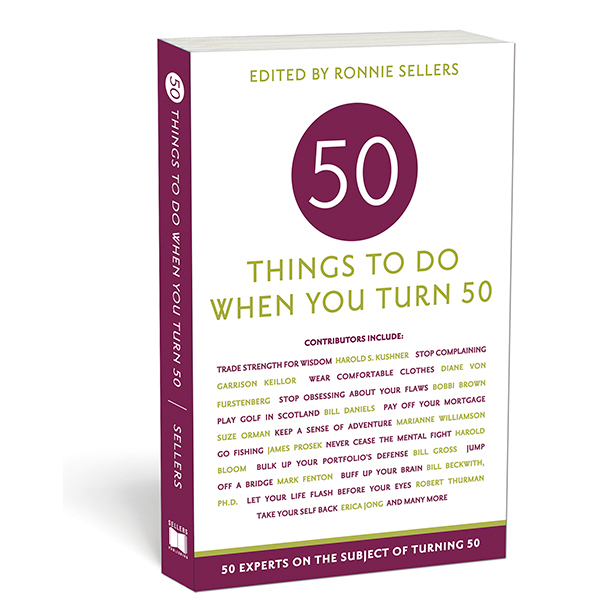 SOUTH PORTLAND, Maine—Sellers Publishing is happy to announce that as it approaches the ten-year anniversary of publishing its book, Fifty Things To Do When You Turn Fifty, donations paid to cancer-related charities from book proceeds have reached $350,000. The book, and each of the seven other milestone birthday books that follow it, offers essays by celebrities, pundits, humorists, and experts from various walks of life. Some of the contributors offer advice based on their own experiences of reaching milestone ages. Others offer advice based on their particular areas of expertise. Sellers began donating the royalties generated by the books to non-profit organizations dedicated to curing cancer in 2005. Over the next ten years, Sellers Publishing has made donations to more than 10 cancer related non-profits. 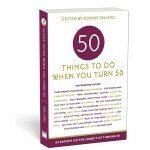 Fifty Things To Do When You Turn Fifty is a hopeful, upbeat, and informative compilation of 50 essays written by world famous artists, pundits and experts on the subject of turning 50. When taken as a whole, the essays comprise a veritable instruction manual on how to make the experience of turning fifty a rewarding one on all levels. The essayists cover such diverse topics as putting the past behind you (Garrison Keillor), making peace with the mirror (Bobbi Brown), bulking up your portfolio’s defenses (Bill Gross), and wearing comfortable clothes (Diane Von Furstenberg). Despite the diversity of topics, tones and perspectives, however, the reader is left with one very positive message by the end of the book: accept and take care of yourself, put your affairs in order and the years that are ahead of you will be the best years of your life. Sellers Publishing, Inc. was cited by Publishers Weekly for four consecutive years as one of the fastest growing independent publishers. The company is located in South Portland, Maine and can be contacted at 800-625-3386 or by visiting their Web site at www.sellerspublishing.com. SOUTH PORTLAND, Maine—For author and wedding planner, Emma Arendoski, a handmade piece is special — it’s been crafted with love and care, which can’t be said for most mass‐produced items. When planning her own wedding, she discovered an abundance of beautiful, handmade goods, along with unlimited opportunities for customization in several online web sites. She was so inspired by this, she founded www.EmmalineBride.com, a handmade‐wedding blog, shop, and vendor guide reaching more than 550,00 visitors per month. Romantically Vintage ‐ Wedding trends come and go, but a vintage themed wedding celebrates classic elements and enduring details that bring forth the best of today and of decades past. Farmhouse Rustic ‐ A rustic wedding is homespun goodness at its finest. Immerse yourself in more than 150 ideas for a wedding celebration on a farm, in a field, or in the woods. Beach Bliss ‐ Sand, sunshine, and gently rolling waves ‐ what’s not to love about the beach? It’s no surprise that a beach‐themed wedding has become a popular choice for couples. Urban Chic ‐ For a couple who loves city life or dreams of getting married in a loft, rooftop, or inside an art gallery or museum, an urban wedding is for you. Traditional ‐ In love with time‐honored customs and rituals, this theme adheres to conventional wedding practices, just not all the time. Mix personal touches with fresh variations and one‐of‐a‐kind details. Free Spirit ‐ For a couple who won’t fuss over frills or swoon over soft palettes and are looking for something different. This theme goes against the herd and doesn’t play by the rules. Boho Style ‐ This style is expressed in a relaxed aesthetic. It’s pleasantly reminiscent of a bygone era of head scarves, gauzy dresses, and loose hairstyles. It’s a touch of floral and a pinch of ethnic, with a romantic hippie influence. Creativity and nature are celebrated in all aspects of boho style. Each theme presented in the book offers custom ideas for topics such as invitations, the ceremony, attire, flowers, the reception, wedding‐party gifts, entertainment, the cake, and more. Each chapter concludes with a Resources section, providing the names and Web sites of the designers and vendors that were mentioned in the chapter. 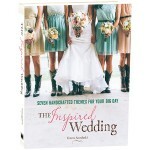 The Inspired Wedding is an 8.75″ x 10.25″, 288‐page, hardcover book with jacket that will be published in September, 2014, and will retail for $29.95. The book includes 500+ photographs to illustrate unique touches and handcrafted items from real weddings. It will be available in bookstores and gift shops nationwide and through Sellers Publishing’s Web‐site, www.sellerspublishing.com.